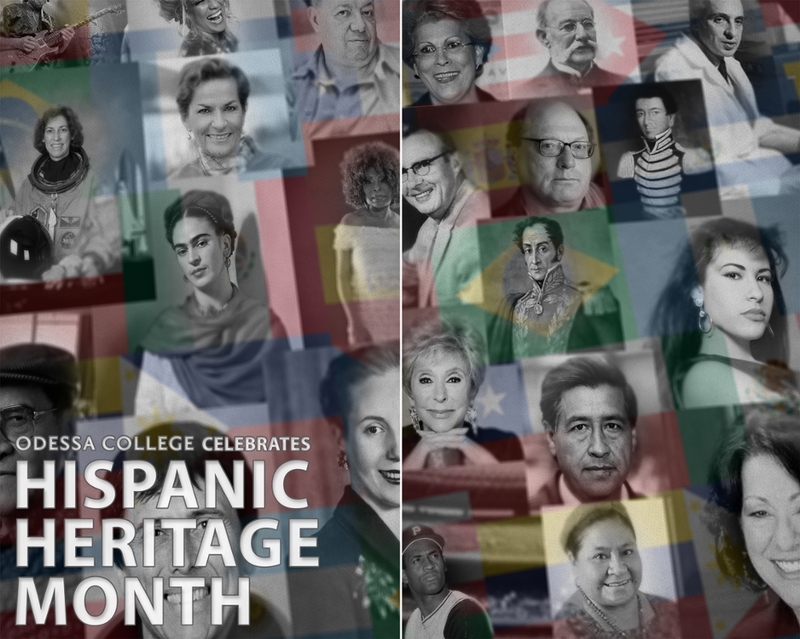 As a Hispanic Serving Institution, Odessa College proudly celebrates Hispanic Heritage Month: September 15 – October 15. Please join us for food, fun and scholarly discussions as we commemorate the histories, cultures and contributions of American citizens whose ancestors came from Spain, Mexico, the Caribbean and Central and South America. The tentative schedule of events is below. Stay tuned for updates and additions to the month-long program. Great Western Dining will be serving a Latin inspired lunch while students and staff create paper tissue flowers to decorate campus. Students eat FREE and the employee meal is $4.33. Visit the TAME Trailblazer at the Permian Basin Fair! TAME, the Texas Alliance for Minorities in Engineering, works to encourage the participation of women and minorities in STEM careers through innovative, hands-on science programming. TAME’s traveling Trailblazers are one-of-a-kind science museums-on-wheels. Exciting, hands-on exhibits teach students about energy, space, weather, biotechnology, and aerodynamics while also introducing them to educational and career opportunities. It is 30 for 30 Night at the Odessa College versus Midland College volleyball game. The OC Dance Team will commemorate Hispanic Heritage Month between the second and third set – intersession. Wear your 30 for 30 shirt and get into the game FREE! Lunch & Learn - What's the difference between Hispanic, Latino, and Spanish? Hispanic, Latino and Spanish are often used interchangeably in describing race. But what's the right terminology? Associate Dean of Teaching and Learning, Diane Carrasco Ph.D., will lead this scholarly discussion. Join us at 12 noon in Gregory D. Williams Hall – and bring your lunch! This event is open to the public. ¡Conversemos! Lunch & Learn – Join Almudena Aguirre-Romero, OC foreign language instructor, for a crash course in basic Spanish. Learn the common words you can use to communicate in Spanish. Join us at 12 noon in Wilkerson Hall 107 - don’t forget to bring your lunch! Join us for a family friendly movie on the lawn. Odessa College will feature McFARLAND USA, the true against-all-odds story of the 1987 McFarland high school cross country team in an economically challenged community. (C) Disney. The movie begins at 8 pm and this event is open to the public. Join us early (at 7:30) for a special presentation by the OHS Mariachi. The October Birthday Bash will feature Latin sweets, treats and recipes to commemorate Hispanic Heritage Month. Starting NEXT WEEK, the Odessa College Sports Center will feature Latin dance and exercise classes every Thursday at 12 noon in the commons amphitheater Logon to www.wranglersports.com for the complete schedule. Student Activities will feature activities throughout campus to promote Hispanic culture, arts and entertainment. Lunch & Learn – Celebrating Latinos in the United States: a discussion about the historical presence, lasting influence, and demographic trends of Latinos in the area, the state, and the country. This scholarly presentation and discussion will also feature music by talented OC students. Join us at 12 noon at the Pecos Center for this event – and bring your lunch. This event is open to the public. For more information, please contact the Pecos Center at 432-445-5535. Students who identify 10 famous Hispanic people and earn Drive to Success Points. Please check in with the Andrews Center secretary for more information. Use the Aztec Alphabet to SPELL your name! Learn how to make tissue paper flowers to decorate your FIESTA! Use metal to make Mexican folk art. Lunch & Learn - What's the difference between Hispanic, Latino, and Spanish? Hispanic, Latino and Spanish are often used interchangeably in describing race. But what's the right terminology? Associate Dean of Teaching and Learning, Diane Carrasco Ph.D., will lead this scholarly discussion. Join us at 12 noon at the Odessa College Andrews Center. Lunch plates will be available for $5. This event is open to the public.